My aunt called me this evening and told me about a call she received and the caller ID read: STOP OBAMA 202-558-3148. She figured it was a pre-election call and they forgot to turn off the machine. 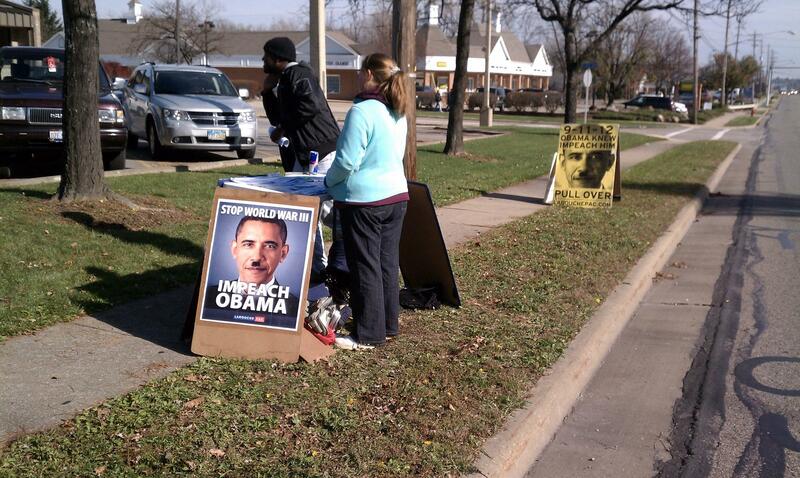 The male caller was ranting in anger about Obama, not new stuff- the birth certificate, Guantanamo, blah blah. She said his rant sounded like Hitler trying to stir up the country. He said they were working to have Obama impeached. At the end of the call, she was told to press 1 to contribute and press 2 to have her number removed from their calling list. She hung up, but then called the number back to see what the deal was. My aunt, whom I have never heard utter the F word, went off on them... You effing nuts need to let this go.... and on and on until they hung up on her. I just googled the number and found the following blog post on the Daily Koz. Man, did we ever dodge a bullet this year. Can you imagine living in a nation where these whack jobs are running our country? Daily Kos: The R's are at it again, they cannot be trusted!!!! The Republicans are back at it again and they have no intention on compromising with President Obama...They cannot be trusted!!!!! Their plan is to obstruct and muddy the waters. The reasons are below the fold. This morning I was enjoying my cup up tea when I received a phone call, it was from 202-558-3148, my caller ID said it was Defeat Obama... So I thought what the hell is this and so I answered it. It was a robo call and a man was spewing about how President Obama needed to be impeached for closing Guantanamo, raising taxes, and not being an American citizen. Then I hung up. Sounds like a phishing scheme to be honest. They're using the irrational hysteria of right-wing morons in order to turn a quick buck. I doubt they have any real political aspirations. sounds like these ppl. I encountered them the morning after the election. Will someone please tell them the party is over? The racists don't give up easily. They ought to just call the Donald.